The Canterbury Choir is the children’s chorus at Saint Mark’s. Open to boys and girls between the ages of 7 and 14, the group aims to instill a lifelong passion for singing and for traditional choral music while inspiring young people to service in the church and in the community. The choir is open to all members of the community, regardless of religious affiliation, and there is no cost to participate. No musical background is required. The Canterbury Choir season runs from September to May. Throughout the season the group rehearses weekly on Wednesday afternoons and sings monthly for the 10:30 a.m. service of Holy Eucharist on the first Sunday of every month. Choristers are asked to make a commitment of regular attendance at rehearsals and services. 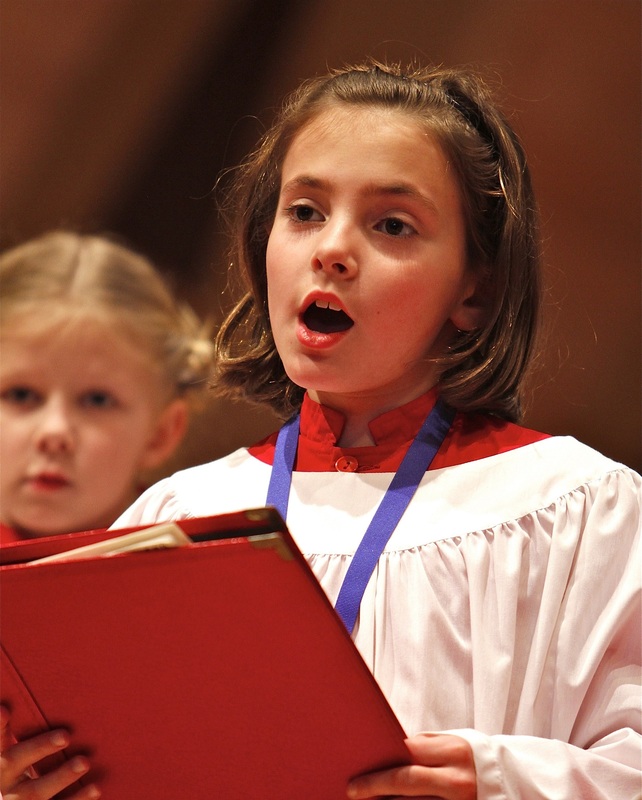 New choristers who have a limited background in music may begin in the Saint Nicholas Choristers, a training program that orients new singers in preparation for the Canterbury Choir. Novice choristers learn about correct breathing and use of the vocal mechanism; how to match pitch and read a musical score; how to process and recess; and how to participate fully in the liturgy. Participation in the Canterbury Choir is an excellent opportunity for children to receive a free musical education. Choristers learn how to sing, how to read music, and the basics of music theory. The benefits of studying music are myriad, and numerous studies have shown that children who participate in musical ensembles develop greater self-confidence and perform better academically. Those who demonstrate the ability also may have the opportunity to sing as a soloist at various times throughout the year. At the same time, choristers learn the importance of working well together as a group. As worship leaders, choristers discover the value of service and develop valuable leadership skills, lessons that serve them well in the church and in the community. Choristers who demonstrate strong musical ability and leadership skills may achieve the position of Head Chorister within the group, giving them the opportunity to develop peer leadership skills. Saint Mark’s is an affiliate member of the Royal School of Church Music (RSCM) in America. The RSCM promotes musical education and a love of choral music through acclaimed instructional programs and materials. Saint Mark’s follows the RSCM’s Voice for Life curriculum, which allows choristers to progress in their musical education at their own pace. Choristers earn variously colored ribbons, which they wear over their choir robes, as they advance within the curriculum. Saint Mark’s also maintains a scholarship fund to assist choristers who would like to attend one of the RSCM’s outstanding summer camp programs. Contributions to the Gary L. Garber Scholarship Fund help send choristers to the RSCM Camp program, and may be made online HERE. In addition to singing for regular monthly services, the Canterbury Choir sings for several special events throughout the choir year. Each December the group joins the adults of the Saint Mark’s Choir for the parish’s annual Festival of Advent Lessons and Carols, a seasonal favorite. The choir also plays a featured role in the parish’s beloved pageant service on Christmas Eve. In the spring the group leads the music for one of the principal services on Easter morning. In recent years, the choir has concluded its season by leading a special service of Choral Evensong in May. The choir also participates in several activities beyond the walls of the parish. Each December the group sings Christmas carols for the annual Christmas by the Clock celebration at Tremont Center in Upper Arlington. In the spring, the choristers enjoy a group outing to an artistic or educational destination in Ohio. Every two or three years, the choir undertakes a major trip to Washington, D.C., to visit Washington National Cathedral and the National Gallery of Art. The trip offers a unique opportunity for children to experience our nation’s capital from both a cultural and a faith-based perspective. One of the great joys of participating in a choir is the camaraderie that develops as choristers work together toward a common goal. The sense of accomplishment that comes from a job well done is infectious and empowering, and choir friendships frequently endure long after choristers conclude their tenure with the group. Parents also have the opportunity to socialize on a regular basis.